Self-ligating technology removes the need for ligatures, the esthetic bands that were used to hold the wire in your braces. This innovation has major advantages. The Clarity SL braces design can help your teeth move faster, make your braces easier to clean, and eliminate the hassle of stained elastics. You can spend less time in the doctors chair, and maybe even have fewer visits. And because your teeth can move into position more efficiently, your overall treatment time may be shortened too. Clarity™ SL Self-Ligating braces are small and smooth, providing greater comfort. These self-ligating braces allow your orthodontist to use lighter forces during your treatment, while still giving you a lasting, beautiful smile. That's comfortable! Clarity™ SL Self-Ligating braces design helps your orthodontist create full, vibrant smiles with fewer appointments and in less time. This means more free time for you. That's convenient! Clarity™ SL Self-Ligating braces, your orthodontist no longer needs to use the little elastic bands that attract plaque and catch food. This makes it easier for you to clean your teeth, to maintain good oral hygiene, and easier for your doctor to give you the smile you want. That's clean! Clarity™ SL Self-Ligating braces are available in two styles - metal and translucent ceramic - to fit your orthodontic needs and give you the look you want. Clarity™ SL Self-Ligating braces are made from a special ceramic material that blends in with your smile to make your braces less noticeable. 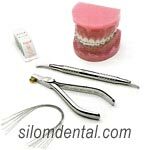 Clarity™ SL Self-Ligating braces also offers your orthodontist all the performance qualities needed to give you a wonderful smile. 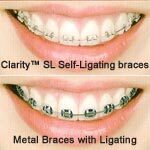 Innovative Clarity™ SL Self-Ligating braces technology makes these braces "self-ligating" and do not require your orthodontist to use elastic bands. 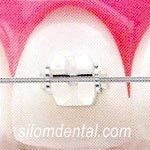 Instead, Clarity™ SL Self-Ligating braces use a unique clip to hold the wire in place. This clip is made from temperature-sensitive Nitinol material and is available only from Clarity™ SL. This special clip is available whether you choose metal or translucent ceramic self-ligating braces from Clarity™ SL.